Stop clutter in its tracks with our kitchen organization ideas! No matter what the size of your kitchen, keep reading for five clever organization hacks that will help you make your kitchen more organized in a matter of minutes. With a couple of simple kitchen organization products, you’ll learn how to de-clutter and make sure everything is in its place, ready for when you need it. If we could give you one tip for organizing your kitchen counters, it would be to make use of wall space as much as possible. 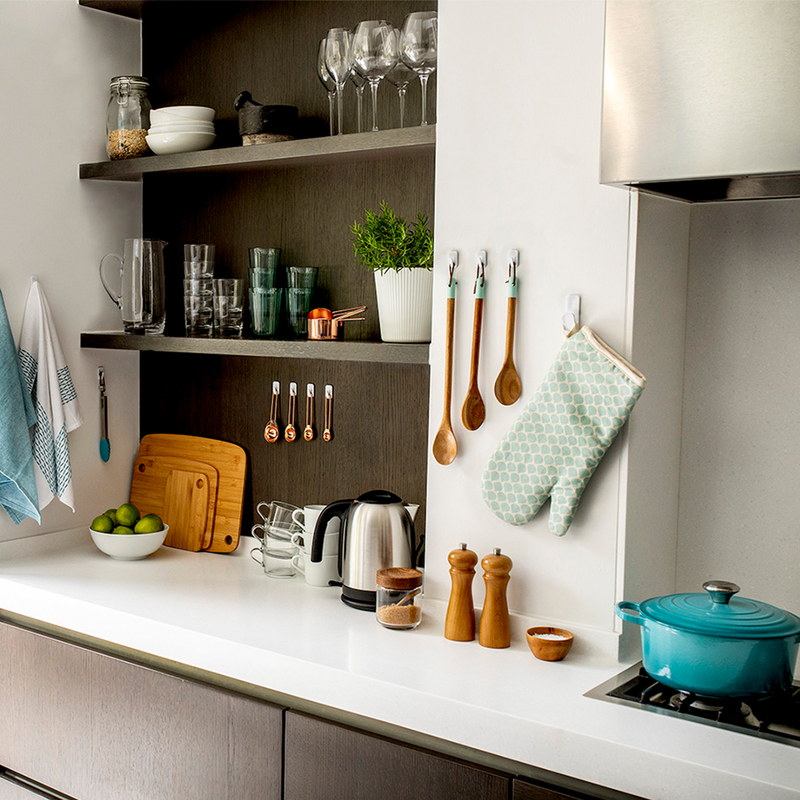 De-cluttering your counters means you’ll instantly have much more space for food preparation but your kitchen accessories will still be on hand for when you need to use them. How about hanging tea towels and utensils on the wall with VELCRO® Brand HANGables® Removable Hooks? They come in three different colors and peel off the wall without damaging your decor! Save space in your cupboards or on your kitchen counter by making a DIY wall-mounted spice rack! This is a great way to make your kitchen more organized and create a stylish new feature for your kitchen decor. 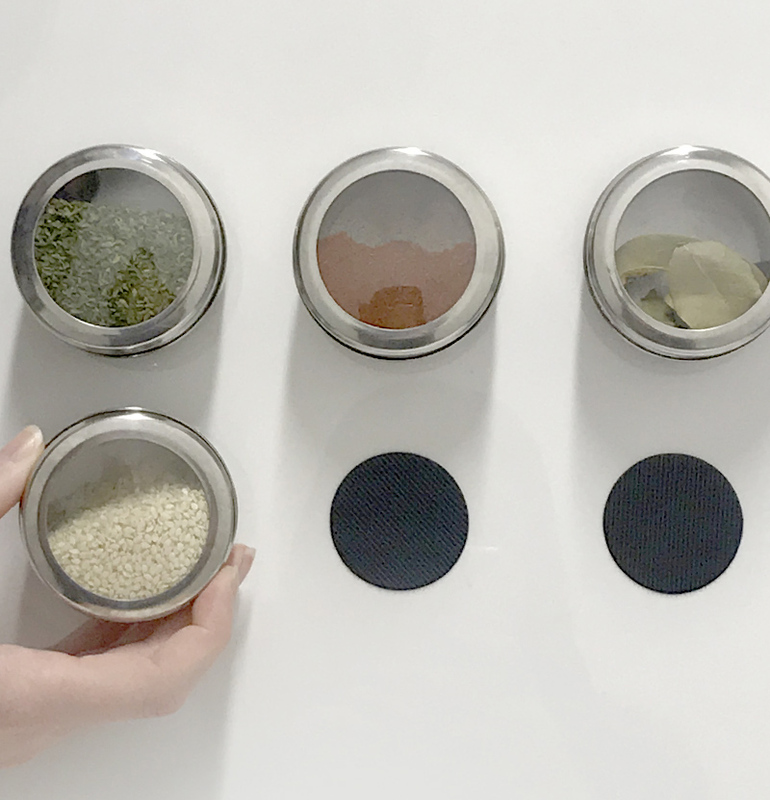 Stick your herb pots to the wall with VELCRO® Brand Industrial Strength Coins in whatever formation you like and when you need to grab some herbs, simply peel the pot off the wall and re-stick it when you’re done. A super easy way to de-clutter your kitchen! If you’re tempted to move all your clutter to your kitchen drawers, here’s a simple kitchen drawer organization hack that will stop the mess getting out of control. Sort through the contents of each drawer and throw out anything you no longer need/want. 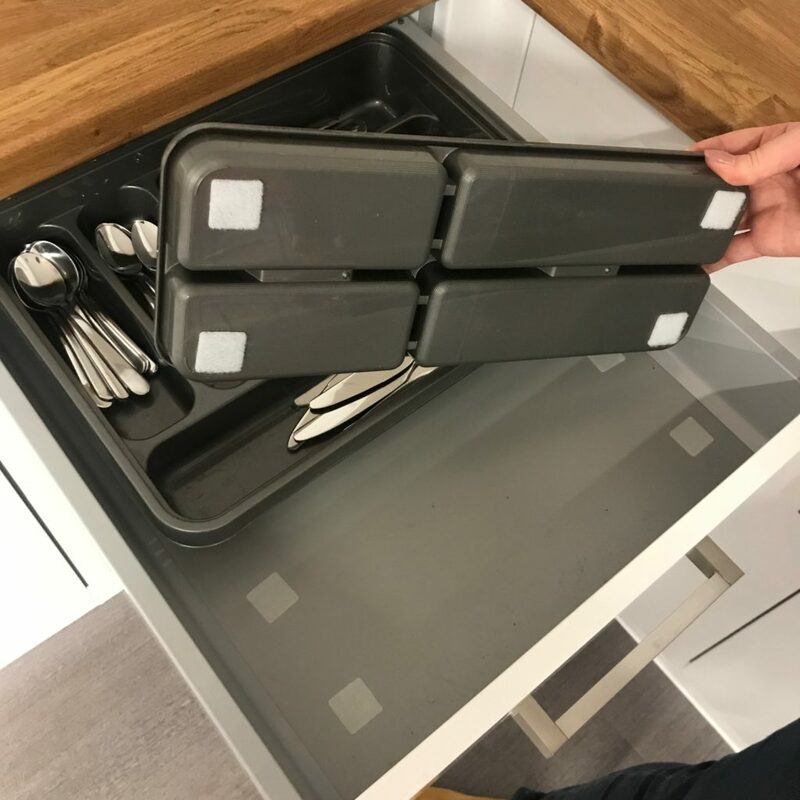 Then use drawer inserts to keep the contents of each drawer neat and tidy, and stick them in place with VELCRO® Brand Stick On Squares to stop them sliding around. 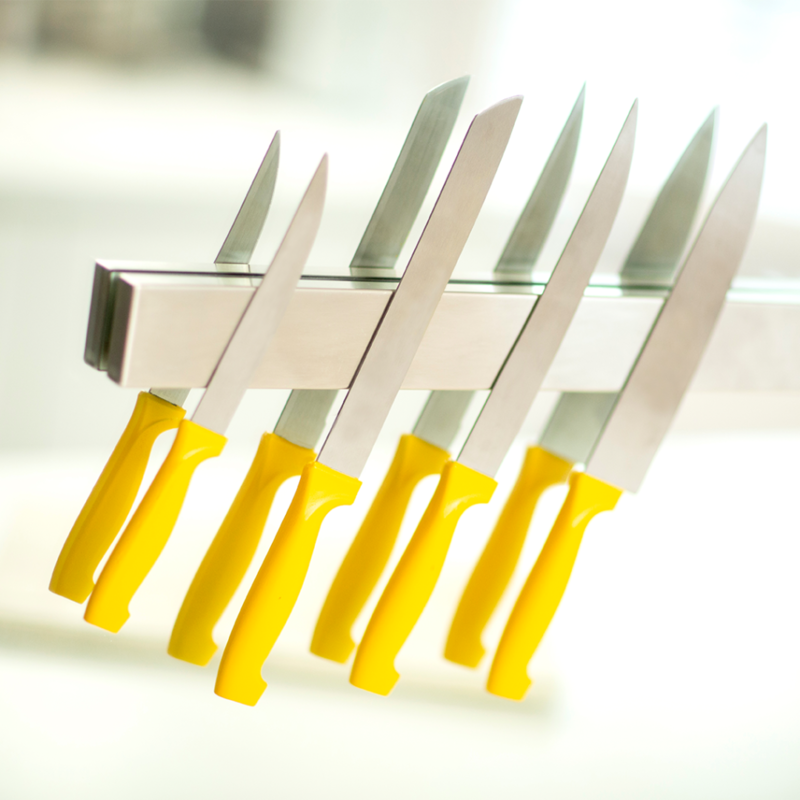 It’s always useful to have kitchen items that you use often within easy reach so how about installing a magnetic knife rack? You don’t need to drill or use nails or screws to install one – simply stick it to the wall with VELCRO® Brand Industrial Strength Tape that sticks securely to a range of surfaces including tile, metal and painted drywall, and is strong enough to hold heavy items. 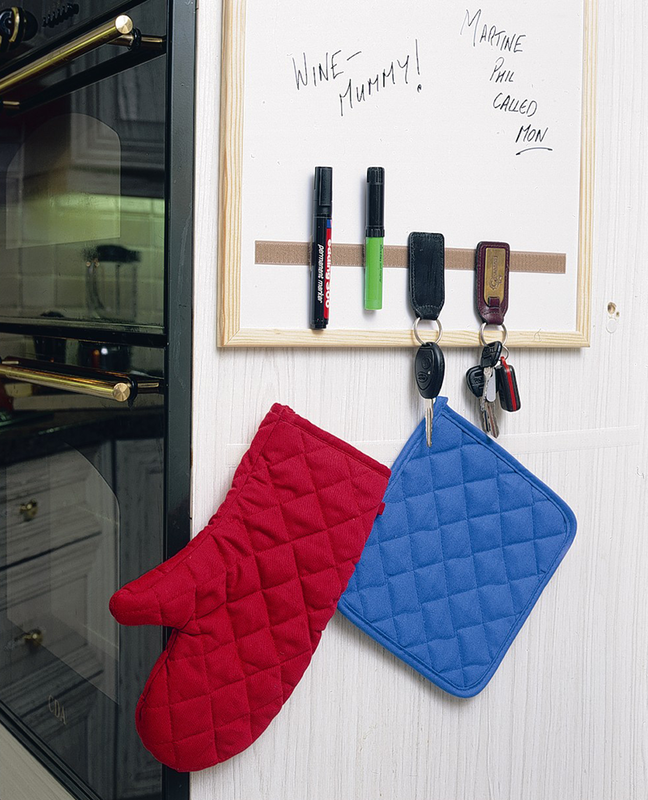 Last but not least on our list of kitchen organization hacks is to install a noticeboard!! They’re ideal for writing shopping lists and memos to yourself and a noticeboard is much more organized than loose pieces of paper. And if you don’t want to put holes in your walls, you can hang the noticeboard with VELCRO® Brand HANGables® Removable Wall Fasteners. 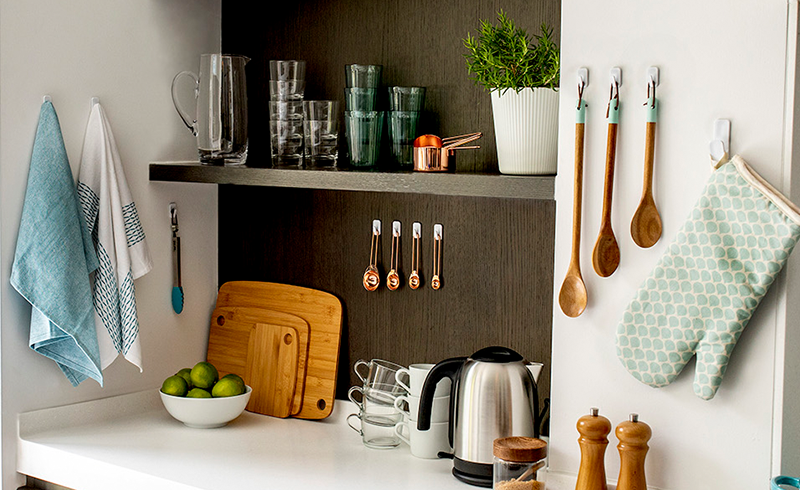 Ready to organize your kitchen? Let us know if you try out any of these tips and hacks and for more easy home organization ideas, stay on our blog!